The client contracted with ACI to redesign the existing website to create a design outside the existing Virginia Tech template while still utilizing colors and logos related to VT branding. In addition, the client wanted a new interface to showcase statewide projects, feature faculty and staff, and improve site usability. ACI recommended Joomla as the new content management solution along with some custom development to meet all the client’s requirements. 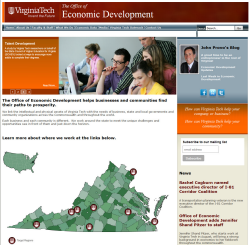 Some of the custom areas included the interactive Virginia map highlighting projects and the dynamic Faculty/Staff area. ACI configured many interactive Joomla components as well including slide show, newsletter, and site search.